Although the concept of a wristwatch is not quite new, during the latest 5 years they began to be more and more fashionable. 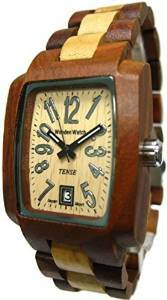 A wood watch is first of all very chic, extremely elegant and not a burden for the environment. 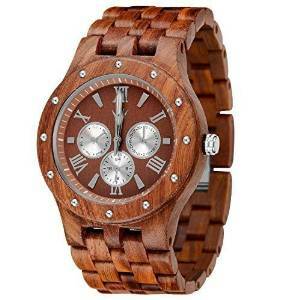 For a man who loves to dress casual, a wood watch is the perfect choice. There is no doubt that this type of watch is a very chic alternative for a regular metal or plastic one. 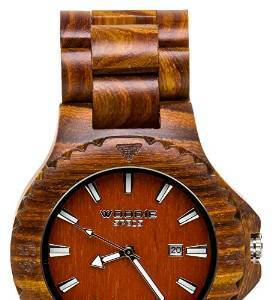 Made from walnut wood, this is a stunning wood watch. No two pieces of wood are exactly the same so that makes it unique. Well, first of all this a very good looking watch. 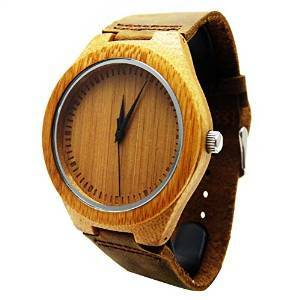 Wooden watches case is made of pear wood and it has sporty and fashion design that looks just fantastic. Pear wood’s delicate texture and quiet dignity make it a fascinating feature of a fine work in wood. It is a pale pink or light reddish brown. Pear is sometimes steamed to deepen the pink coloration. With scratch-resistant crystal covered in synthetic sapphire this watch is very chic and versatile for any occasion. 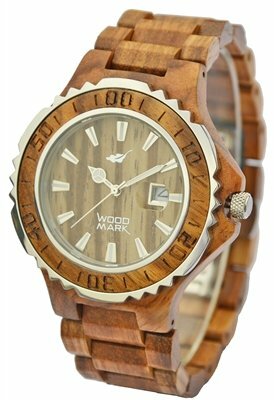 Tense Wood Watch is part of the G8303 series, which was just introduced to the Tense Watch line. 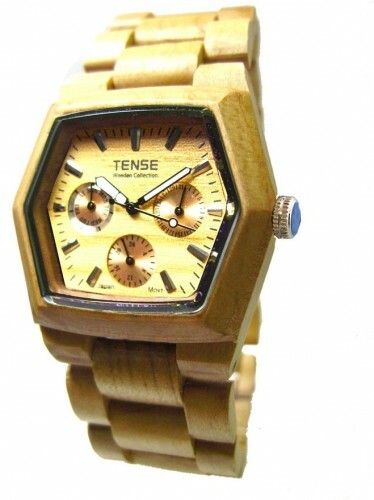 Tense is the first to boast the first triple dial window in the world in a wood watch! 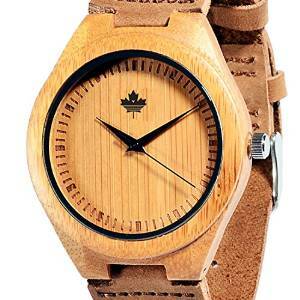 This watch is made with maple wood and designed with similar light wood face. It has a lot if interest features (besides it tremendous look of course) such as feather-like weight, hexagon unique face or 2 year warranty from Tense when card is sent within 30 days of purchase. Very lightweight, this chic watch will complete every man’s outfit. This watch is unique, exclusive and very exotic. For sure this is a perfect eco-friendly watch. It is extremely lightweight and looks great, a perfect accessory indeed. The leather band of this watch looks great and it completes very nice the watch’s look. It worths mentioning that it is handmade from real wood. 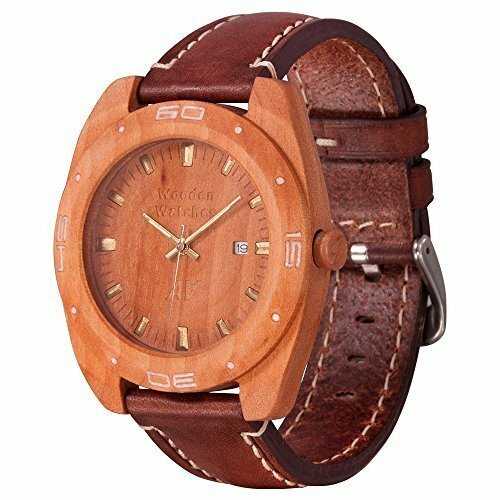 Made from solid wood and stainless steel clasp for hypoallergenic people, this wood watch is very lightweight and comfortable. 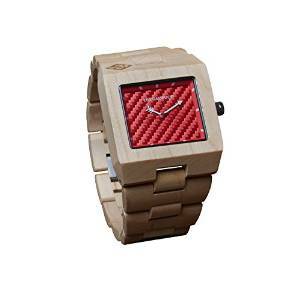 This is a very good looking watch, a chic accessory for a trendy man. It is also very comfortable which is important for a watch if you wear it all day long. If you want a natural, chic and good value for the money, this watch is the perfect choice for you. It has 100% Japanese Miyota Quartz movement, Energy Saving, Ultra-quiet and Long-Lift time. Also a strap made from genuine soft PU leather.